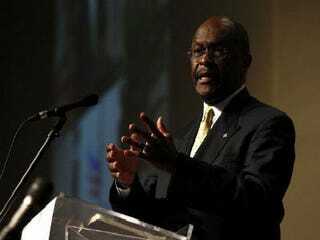 In a blog entry at the Washington Post, columnist Jonathan Capehart smacks down GOP presidential hopeful Herman Cain's claim in a political advertisement that as "a descendant of slaves," he can lead the Republican Party to victory by garnering a large share of black votes. Okay, um, wooo ... 8, 9, 10. It’s that kind of delusional talk that reinforces the image I conjured up last week of Cain running for president of the Land of Make-Believe. Only there could he hope to surpass, let alone replicate, President Eisenhower’s remarkable (by today’s standards) electoral success with African Americans. Keep something in mind about that 41 percent of blacks who cast a vote for Eisenhower. That’s 41 percent of blacks who COULD vote in 1956. The Voting Rights Act of 1965 did away with the discriminatory laws that blocked many African Americans from exercising their right to vote. Read Jonathan Capehart's entire blog entry at the Washington Post.